It's time for a new challenge at ﻿Addicted To CAS. This challenge is hosted by Anja and she chose the code word - HERO. If you love this Super Birdbrain you can find the Digi Stamp HERE. Super Birdbrain was printed on white , then colored with Copics and fussy cut. I added a black border to the stripe strip and then popped the whole panel up on foam. Your little birdbrain is adorable, Doni! Beautiful Copic coloring, and I love the diagonal stripes! Such a cute card! FUN card, Doni and i like how you´ve placed Super Birdbrain on your card. 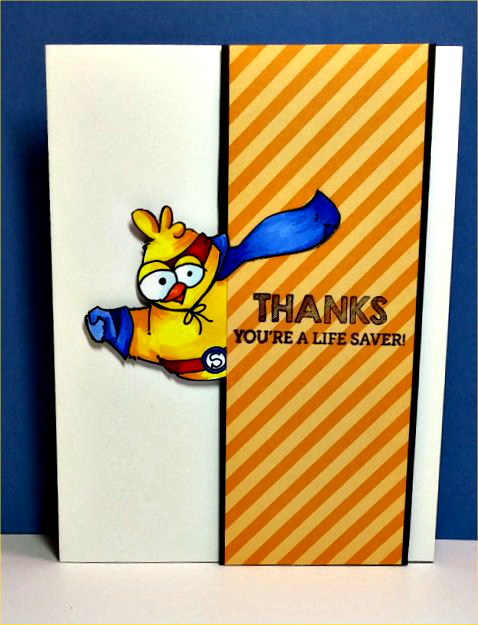 What a great sentiment and a fun hero-stamp! Your card is bold and cute at the same tieme! Thanks for the GDT-spot this month!